Plain old cornbread…sure, people love it. 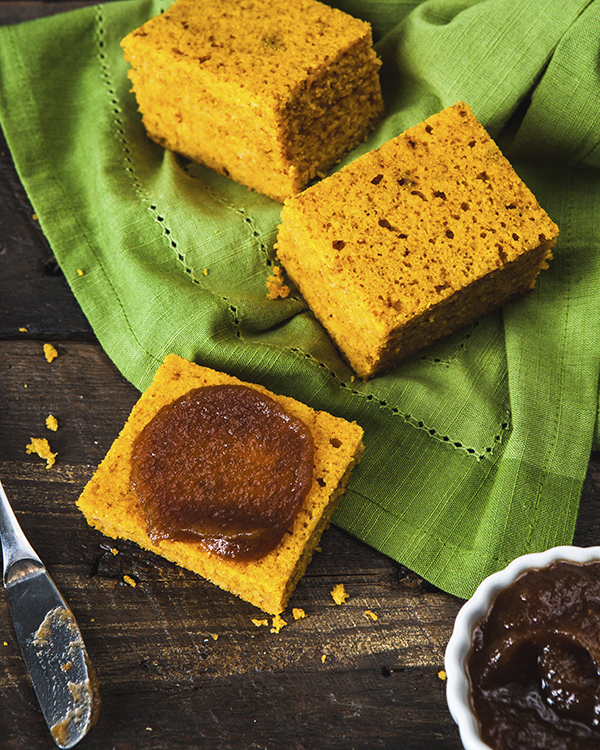 But pumpkin cornbread is next-level awesome, with its beautiful orange hue, moist crumb, and hint of spice. Put it out in batches so that greedy people don’t snag three pieces at once. Spread on some apple butter and your heart will feel like fluttering autumn leaves. 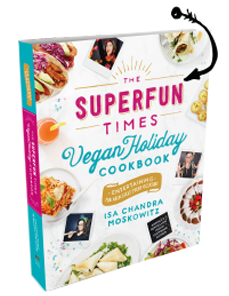 This recipe is from my latest cookbook, The Superfun Times Vegan Holiday Cookbook. ~You can use homemade pumpkin puree (or any winter squash, really) for this recipe. Slice your squash in half and remove the seeds. Roast at 350 F with a little oil until very tender. Scoop out the flesh and puree! I especially love butternut and red kuri for this recipe. ~If you want to make your own pumpkin pie spice, combine 1/2 teaspoon each ground cinnamon, nutmeg, ginger and allspice with a pinch of cloves. Preheat the oven to 350°F. Lightly grease a 8-inch square baking pan. Measure the almond milk into a liquid measuring cup and add the apple cider vinegar. Set aside to curdle. In a large mixing bowl, mix the pumpkin puree, maple syrup and coconut oil. Mix in the almond milk and beat until well incorporated. Sift in the cornmeal, flour, baking powder, pumpkin pie spice, and salt. Stir just until combined. Transfer the batter to your prepared baking pan. Bake until the top is golden and firm to the touch, 30 to 35 minutes. Let cool slightly before slicing. I’ll report back on tastings. Yes! made this with chili last night and it’s good! I tried this, it’s good! It pairs just as well with savory scrambled tofu as it did with sweet jam. I followed the recipe exactly with the exception of using whole wheat pastry flour instead of all-purpose. Mine took 55 minutes to bake to a point that wasn’t still batter in the middle, but the edges and top are not overdone and it still has a nice moist crumb. I pre-ordered the book – can’t wait for more new recipes to try! Mine is in the oven right now. I think I messed it up somehow! It’s been in there for a total of about 55 minutes but the inside is still gooey. The outside is starting to get crispy so I can’t keep it in for too much longer. I put some foil on it and put it on a different rack in my oven so I’m crossing my fingers it firms up in the next five or ten minutes. It tastes delicious though so we’ll definitely still eat it. Does anybody know what I did wrong? What gluten free flour could you use instead of unbleached wheat flour? I made this tonight and it was amazing! I don’t even like cornbread but this was delicious! I may be bringing this to Thanksgiving dinner. So this problem always comes up whenever I use coconut oil; even if I melt it, it always seems to congeal in the batter. This makes it clump up and get unevenly distributed throughout the batter and it doesn’t seem to melt as it bakes. Any suggestions on how to avoid this? I had the same problem as Vicky did. With this and the regular cornbread. It never turned into bread but rather remained gooey. After cooking it for 2 hours, nothing more was happening so we took it out. The flavor was good, but the consistency was disconcerting. We ended up cutting it in half depth-wise and frying pieces in coconut oil, sort of as if it were polenta. It tasted pretty good, but wasn’t cornbread! I have found through the years that many Vegan recipes function just fine without egg (even pancakes). But I don’t understand how these are holding together so beautifully, because even traditional SAD (standard american diet) cornbread has somewhat of a dry crumbly texture. I have Since given up Vegan baking, since getting diagnosed with Celiac Disease and going gluten free 16 years ago, Gluten Free baked goods are a complete nightmare Vegan! All egg replacers produce a less than ideal outcome in GF flours…that glue-y gluten really seems necessary. Every pancake I make has a slimy raw sensation in the center. Do you measure the 1/4 cup coconut oil before or after melting? Never had anything likes this. Thanks for the recipe. This is such a wonderful recipe! My kids are having this today for dinner! Thanks you, Isa! The link to find out the best and easiest ways to find out files and folders in windows 10 is before so be quick and seize information. very wonderful … i truly like your blog. Very beneficial info. Thx. thanks for this . i should try !!! I especially love butternut and red kuri for this recipe. nice information for a brand-new blog writer … it is truly handy. You will be glad to find out the best site for setting setclockwindows clock in windows 10 and can also update your time zone. this is extremely useful and also intersting for those who have an interest in blogging field. This is such a wonderful recipe! My kids are having this today for dinner! Thanks Isa! very nice article i’ll try this today. thanks for sharing this. wow, nice recipe, thanks for sharing this post. good job..nice article….keep it up! This looks so tasty thanks for sharing this post.